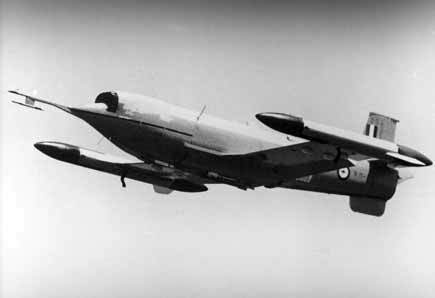 The Jindivik was a sub-sonic unmanned jet propelled target plane (target drone) developed as part of a bilateral agreement, regarding guided missile testing, between Australia and the United Kingdom. As part of the agreement the Australian Government was contracted to develop an unmanned target aircraft capable of a 15-minute sortie at 40,000 feet. Development of the Jindivik began in 1948, with the first flight of the manned derivative, known as the Pika, taking place in 1950. The first flight of the unmanned version (Jindivik) was conducted in August 1952. Jindivik is strongly believed to be the Aboriginal word for ‘hunted one’ although may also mean ‘to consume ‘ or ‘destroy’. The Jindivik Mk.1 was powered by an Armstrong Siddeley Adder (ASA.1) turbojet, which was developed as a disposable engine for the project. Only 14 Mk.1s were built before a modified version, the Mk. 2 entered service. The Mk.2 was powered by an Armstrong Siddeley Viper engine. This engine was designed for a short lifespan – about 10 hours. The control systems were manufactured by various firms including Elliott Brothers, GEC and McMichael, with assistance from the Royal Aircraft Establishment. Control was maintained through an autopilot that received radio commands from the ground, rather than direct flight by a ground controller. Eighteen commands could be issued to the autopilot with six further commands for the operation of other on board equipment. The drone was launched via a self-steering trolley. At 110 knots, the drone applied its flaps, pushed the elevators up and released from the trolley. Landing was made at 150–125 knots. Two controllers (azimuth and elevation) were used to align the drone on the runway. On landing it touched down on its skid and banking would cause the wingtip “shoes” to touch the runway, which controlled its path down the runway as it slowed. Between 1952 and 1986, a total of 502 Jindivik’s were built by the Government Aircraft Factory in Melbourne for use mainly by the RAF, RAAF and RAN, although a small number were exported to Sweden and the United States. The RAN operated a total of 42 of the Jindivik Mk.203A & B series target aircraft from 1966 until 1998. These were based at Jervis Bay Range Facility (JBRF) and were used for live missile and gunnery practice. Its major role was training, mainly with the Seacat and Tartar missile systems – with Seacat requiring a human ‘Seacat Aimer’ to actually guide the missile onto the target. It was also used as a target for Sidewinder air-to-air missiles carried by the RAN’s A4 Skyhawk jet fighter-bombers. Additionally the Jindivik could be fitted with various counter measure systems and could also effectively simulate an enemy missile or aircraft attack against ships. Originally designed as an expendable target the Jindivik’s features and reliability enabled it to fly many times without being destroyed. It had an excellent speed and high altitude performance as well as being able to conduct low-level flight over the sea. It could trail smoke, tow infra-red and radio frequency decoys and fire flares to avoid destruction during live firings. For special tasks the RAN N11 Jindivik Mk. 203A & B series could be modified with wing pods and wing extensions. Powered by a 1134 kg (2,500 lb) thrust Bristol Siddeley Viper 201 turbo jet (Rolls-Royce engines from 1966 onwards), it had a maximum speed of 490 knots (limit Mach 0.86), a service ceiling of 57,000 feet and a range of 540 nautical miles. In the early 1960’s work commenced on a replacement for the Jindivik to be called the Turana. Designed as a derivative of the Ikara anti-submarine missile system, the project failed and the Jindivik was retained in service until 1998 when it was finally replaced by the BAE Kalkara unmanned aerial target. Left: A Jindivik Pilotless Target Aircraft being prepared for flight at the Jervis Bay Range Facility. Right: A Jindivik being shadowed by an A-4 Skyhawk during a test flight.